"The ESVAGT SOV is not just a taxi – it's a collaboration"
For Aart Bark, Regional Service Director at MHI Vestas, teaming up with ESVAGT in the Belwind1 and Nobelwind Parks is more than just engaging a service provider. The first year of SOV operations has been rewarding and informative. Experience with STBs is being integrated into upcoming designs. 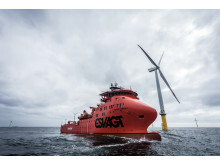 ESVAGT’s two new SOVs are now in operation. Experienced crew chosen to establish working procedures on a completely new vessel in a market that is almost as new. Who were William Froude and Michael Faraday? The SOVs, the ‘Esvagt Froude’ and the ‘Esvagt Faraday’ are well underway with offshore wind farm duties. Focus on the offshore wind energy market means developing new transfer boats aimed specifically at transfer to offshore wind turbines. The ESVAGT boat based crew change is a structured operation where dedicated crews and thoroughly trained personnel work together optimally. That is the explanation why the crew change vessels have achieved 5 and 13 years respectively without a single Lost Time Incident (LTI). Rush of business – especially in the offshore wind sector – gave an increased number of transfers in 2011 at ESVAGT: 11,000 in all.